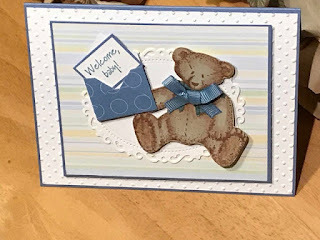 Hello fellow stampers and card makers! I will admit, I am addicted to die cutting. There are so many die sets and bundles on the market its sometimes hard to see beyond what the dies were originally designed to do. Well that's easier to do than you think. For this first communion card, I mixed and matched several brands and designs to make a stunning focal point. I used white and gold shimmer paper although its hard to tell from the photo. It's not necessary to use shimmer paper but it does make the card that much more special and elegant. 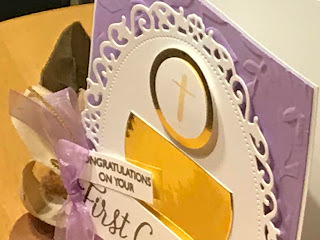 On top of the base card, I layered a slightly smaller lavender piece that I had dry embossed. Using a slightly smaller white piece, I die cut the ornate oval (Spellbinders). 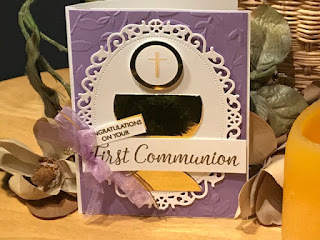 For the chalice, I used a circle die from Stampin' Up. I cut the top 1/3" off to made the bottom. The host above the chalice is done using two sizes of circle punches. 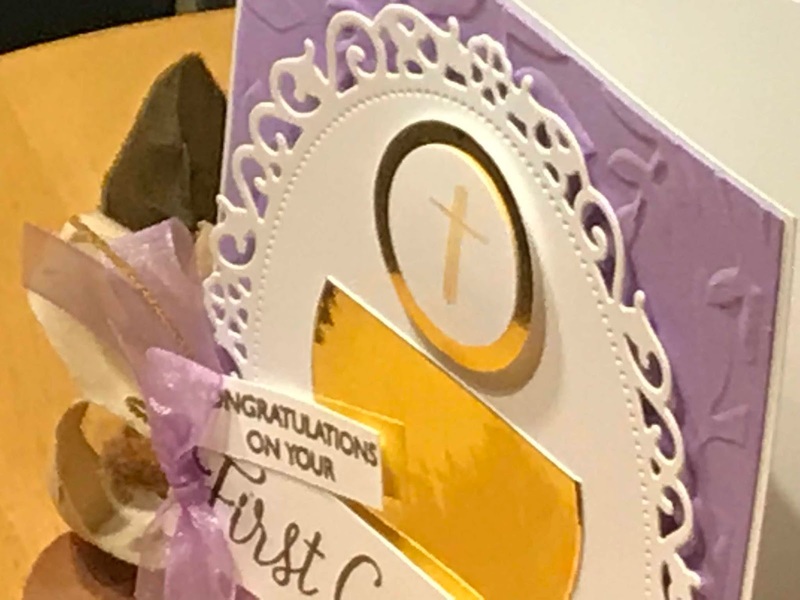 The finishing touches include embossing the sentiment in gold which was cut using a banner punch. I add sheer lavender ribbon for the extra special touch. Start thinking outside the die box, and mix and match for stunning results. I hope you give this a try.